Binance has recently undergone another successful token sale, the third in 2019, as the Launchpad platform sold out Celer Network (CELR) tokens in just 17 minutes. How does this relate to BNB price? Many users had bought up some Binance Coin beforehand, in the hope to take part in the token sale, which is accessible only via BNB. However, during the token sale event, the platform had experienced overwhelming demand and was unable to accommodate everybody who wanted to take part in the sale. According to CZ, CEO of Binance, 39,003 Binance users attempted to take part in the sale with only 3,120 people being able to participate. This had left over 35,000 users holding their BNB they have bought before the sale. It seems that those users that were left out of the sale have started to dump their Binance Coin’s which were intended to buy Celer Network tokens. This is evidenced by the 4.22% price drop over the past 24 hours. Despite the recent price drop, Binance Coin is still up by around 60% monthly gains. 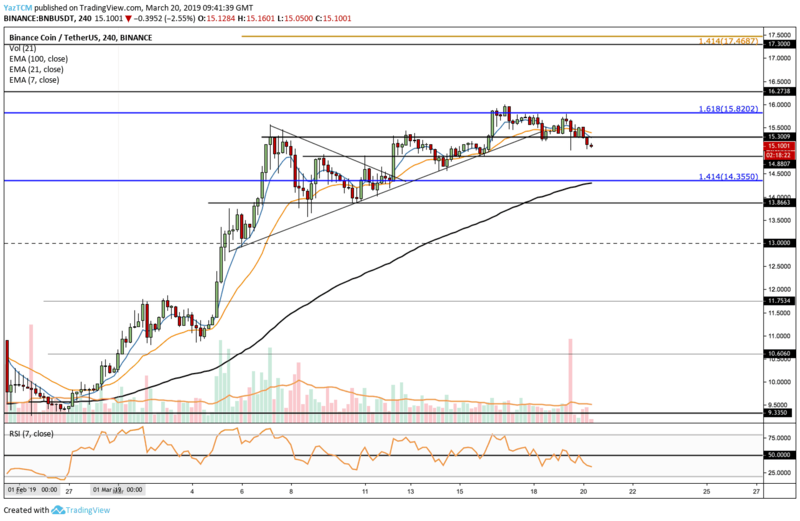 Since the breakout mentioned on our previous BNB/USD analysis, we can see that the market had continued to rise higher: The coin was able to continue up until meeting resistance at $15.82 where lies the long term 1.618 Fibonacci Extension level. Price action has stalled at this level of resistance and has started to fall. From above: The nearest resistance lies at $15.82. Above this, we can expect higher resistance at $16.27, $17.00 and $17.30. From below: The nearest support lies at $14.87. Below this, further support is located at $14.35, $13.86 and $13.00. The trading volume has been slowly declining throughout March. The RSI has recently broken below the 50 level which indicates that the bears have taken control of the market momentum. Following our previous BNB/BTC analysis we can see that the coin had continued to attempt to break above the resistance at 0.004 BTC, which is the all-time high. It was successful in doing so, before getting rejected. Price action has since fallen slightly and has started to decline. From above: The nearest level of resistance lies at 0.00386 BTC before reaching the tough all-time high at 0.004 BTC. If the buyers can push BNB/BTC above, the next resistance is then expected at 0.0042 BTC and 0.0044 BTC. From below: The nearest level of support below lies at 0.0036 BTC. Beneath this, we can expect further support at 0.0034 BTC and 0.003325 BTC where lies the short term .618 Fibonacci Retracement level. 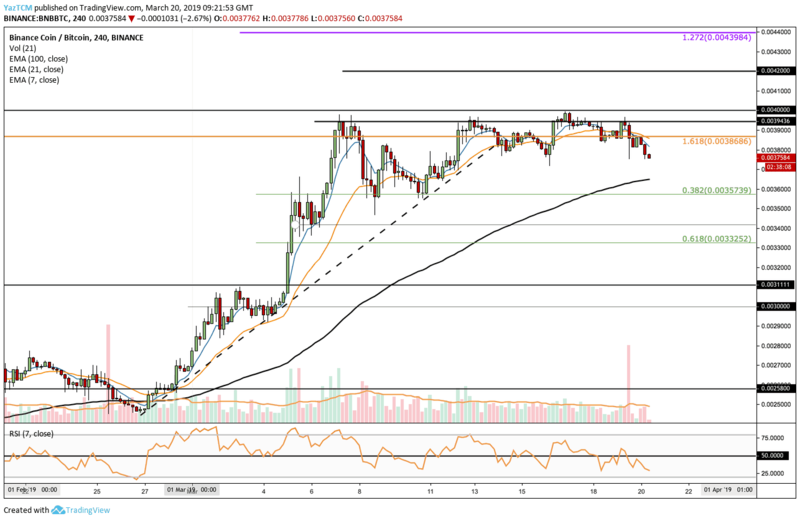 The RSI for BNB/BTC has also broken below the 50 level as the bears take control of the market. The trading volume has also been slowly declining throughout March.